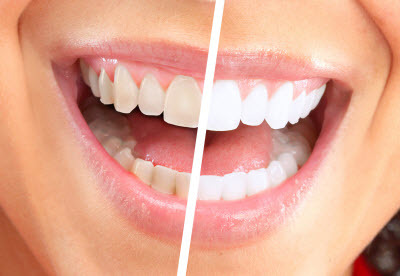 A bright, white smile is easily achieved through the many advancements in teeth whitening techniques. Whether you prefer treatment from a dental professional administer or taking the product home to treat yourself, desired results can be experienced in a matter of days. Dr. Elaine Adler and Dr. Heather Moed have spent nearly 20 years providing teeth whitening, as well as other beneficial cosmetic treatments in Manhattan. If you are looking for a dentist’s office with a friendly, yet professional approach, contact us at Adler Dental today and let our dedicated professionals transform your smile! There are several factors that lead to teeth discoloration. Frequently consuming beverages such as coffee, tea, or soda can stain your natural teeth, especially when you don’t follow up with proper oral care. Other factors that produce a negative effect on the color of your teeth are tobacco use, an unhealthy diet, and routine wear and tear. A professional grade bleaching gel will effectively lift extrinsic, or surface stains after a few days, but when the discoloration happens beneath the enamel, or intrinsically, an alternative treatment may be necessary. These stains are typically caused by aging, taking certain medications, or overexposure to fluoride. While porcelain veneers offer the most comprehensive way to conceal intrinsic staining, some teeth whitening companies have improved the strength of their bleaching formula enough to make a positive impact with extended treatment. Once you’ve decided to undergo teeth whitening, Dr. Adler and Dr. Moed will determine if the in-office treatment or the customized take-home kit is a more convenient option for you. With our chairside service, we use Glo® bleaching gel, a powerful product that produces dramatic results with a shorter treatment time. To combat potential tooth sensitivity, we offer Glo’s post-treatment paste to apply at home as needed. More of our patients prefer Glo’s customized take-home kits, which are clinically proven to improve the brightness of your teeth by up to five shades in as little as a week. Included in your kit are the customized trays and bleaching gel for a simple approach to at-home teeth whitening. The product is specifically designed to cause minimal sensitivity, but patients are welcome to take home the desensitizing paste for additional relief. Schedule an Appointment in Our Manhattan Office Today! When you want to improve the aesthetics of your smile, our dedicated staff at Adler Dental PC has the expertise that will renew your confidence after cosmetic treatment. If you are interested in experiencing the benefits of teeth whitening in Manhattan, call our office today to set up an appointment. Ready for Easter? Your Hunt for a Brighter Smile stops here! Contact our office today for more information!